pipelines.lsst.io is automatically built and deployed for each lsst_distrib build. You don’t manually build and update the website when you contribute to the pipelines_lsst_io documentation repository. You can, however, preview a development branch of the pipelines_lsst_io repository by manually running the sqre/infra/documenteer Jenkins CI job. Since pipelines.lsst.io is published through LSST the Docs, builds for development branches appear as new editions from the pipelines.lsst.io/v version dashboard. You can’t use this Jenkins CI job to test development branches of packages with the pipelines.lsst.io site build. This Jenkins CI job always uses packages corresponding to a released EUPS tag (such as a daily, weekly, or stable release). Only the branch of the pipelines_lsst_io repository can be modified. This section describes how most contributors will use the sqre/infra/documenteer Jenkins job: to preview a ticket branch of the pipelines_lsst_io repository. In this example, the ticket branch is called tickets/DM-16182. First, go to the sqre/infra/documenteer job’s page, then click the Run button. Then fill in the fields as shown in the following screenshot. The d_latest EUPS tag automatically aliases the most recent EUPS daily build tag. Using d_latest here is useful because when you’re writing new content for the pipelines_lsst_io repository, you often want to pair it with the latest version of the lsst_distrib package. LSST the Docs uses this field to build the “slug,” or /v/<slug>/ URL path prefix, for alternative documentation editions. In this case, you want to use the name of the branch in the pipelines_lsst_io repository to identify the edition as corresponding to the tickets/DM-16182 development branch. LSST the Docs automatically transforms this value into the /v/DM-16182 path prefix. This field determines which branch of the GitHub repository (pipelines_lsst_io) to clone and build. Use the development ticket branch, tickets/DM-16182. Leave this field checked so that the built documentation site is published to the web. You can find the edition at https://pipelines.lsst.io/v. This section has more information about each configuration field. This field means that you can only build documentation for tags of Stack packages that have been released by Jenkins CI. Set this field to either a Git ref or an EUPS tag. LSST the Docs uses this information to populate the version slug of the edition (the part of the URL directly after /v/). If you are building with a non-master Git ref of the pipelines_lsst_io repository (see git repo ref), set this field to the name of the pipelines_lsst_io branch being built. Example: you have a branch called tickets/DM-16182 in the pipelines_lsst_io repository. Set this field to tickets/DM-16182. LSST the Docs automatically transforms this value into the /v/DM-16182/ edition path prefix. If you are rebuilding documentation for a released version of the lsst_distrib package, set this field to the name of the corresponding EUPS tag. Example: you are rebuilding documentation for the d_2018_10_29 EUPS tag of lsst_distrib. Set this field to d_2018_10_29. Note: you generally will never do this as developer contributing new content. This is the GitHub repository slug for the main documentation repository. This should always be lsst/pipelines_lsst_io. This is the name of the Git branch, tag, or commit SHA of the main documentation repository (pipelines_lsst_io) that you want to build. If you are building a ticket branch of pipelines_lsst_io, this is the name of that ticket branch. It will be the same as the string you set on the LTD edition slug field, above. If you are building an EUPS release, set this field to the name of the Git branch, tag or commit SHA corresponding to the EUPS tag. 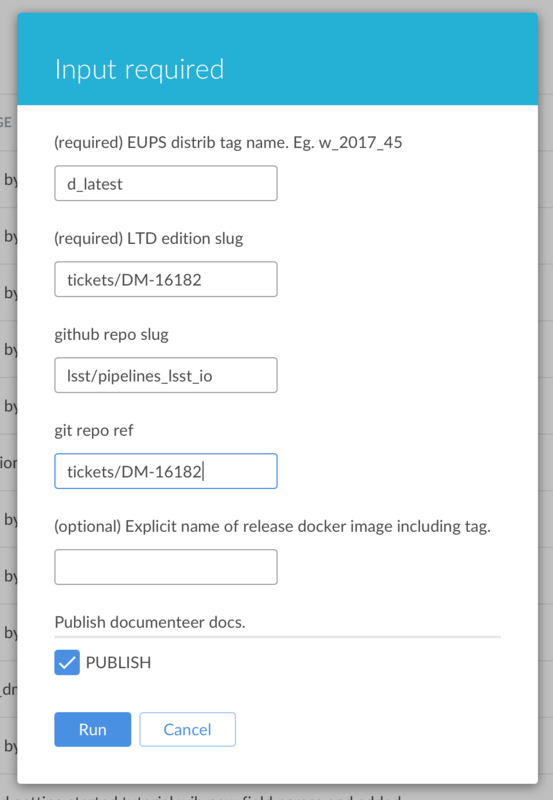 Ensure that the Publish option is checked so that the build site is published as a development branch on pipelines.lsst.io. Once the job successfully finishes, open pipelines.lsst.io/v and find the corresponding edition that you just built.